The NEX-EA50UH is a professional NXCAM Camcorder with a large format Exmor™ APS-C HD CMOS sensor and interchangeable E-mount lens system providing exceptional creative freedom when shooting both Full HD movies and high-quality still photos. It is supplied with the newly developed SEL18200PZ18-200mm Power Zoom E-mount lens providing auto focus, continuous variable iris and Optical Steady Shot™ image stabilization with Active Mode, making it ideal for shooting moving images. The unique design of the NEX-EA50UH further adds to the camcorder’s versatility. When the shoulder pad is extended, the camcorder can be balanced on the shoulder giving added stability for longer shooting times. 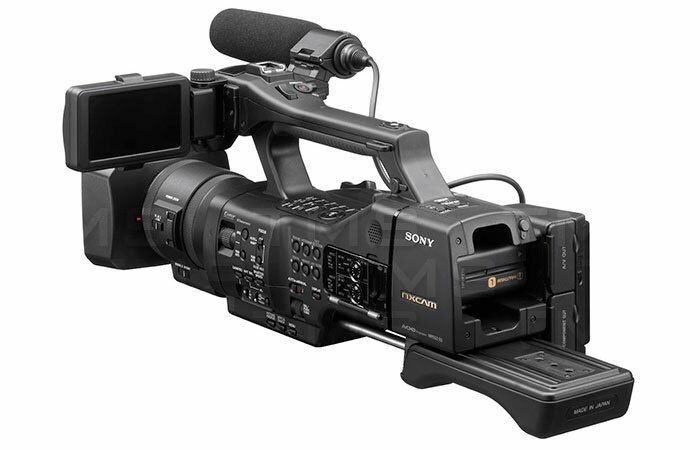 Alternatively, when the shoulder pad is returned to its original position, the camcorder becomes compact enough to use in various handheld styles, allowing users to capture a wide variety of shots. The NEX-EA50UH incorporates the Sony E-mount interchangeable lens system, which enables auto focus, auto exposure and stabilisation during shooting. With its short flange back distance, it is possible to attach both established A-mount lenses via the LA-EA2 lens mount adapter, and an unrivalled choice of other brands lenses using third-party adapters. The NEX-EA50UH camcorder comes with the newly developed Power Zoom E-mount lens E PZ 18-200mm F3.5-6.3 OSS SELP18200. It features auto focus, continuous variable iris and Optical Steady Shot image stabilisation with Active Mode, making it ideal for shooting moving images. 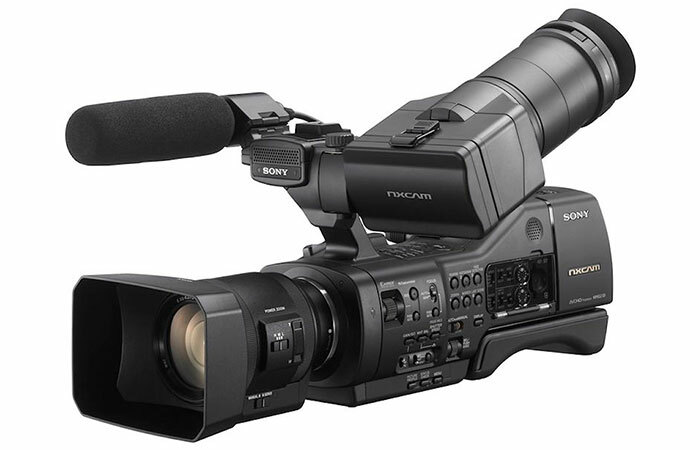 It is electronically controlled by both the zoom rocker lever on the camcorder grip and top handle. Film-makers can achieve a constant zoom speed and smooth, slow zoom, both of which can be difficult to accomplish with manual zoom lenses. In addition, using fixed focal length lenses users can simulate a zoom effect using the smart digital zoom function, ensuring fast-paced shots are never missed. 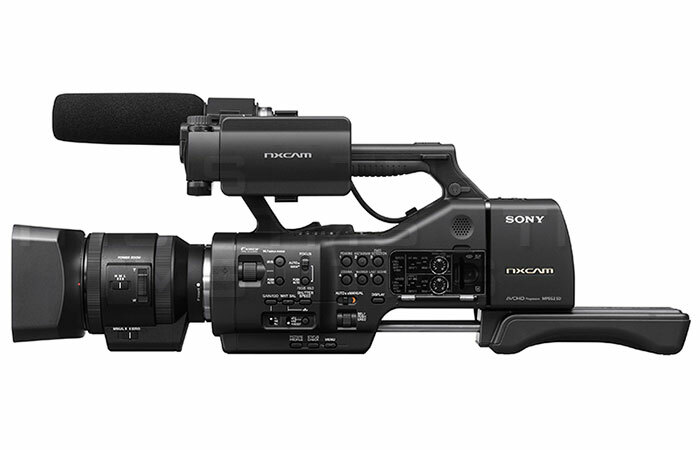 The NEX-EA50UH features a range of professional functions usually associated with NXCAM camcorders, such as 2-channel XLR audio, Linear PCM audio, time code, user bit and built-in GPS. The camcorder can capture 16.1 megapixel still pictures with JPEG format support only. In addition, the NEX-EA50UH has a built-in mechanical shutter to eliminate shutter-induced blur during long exposures while capturing still pictures. 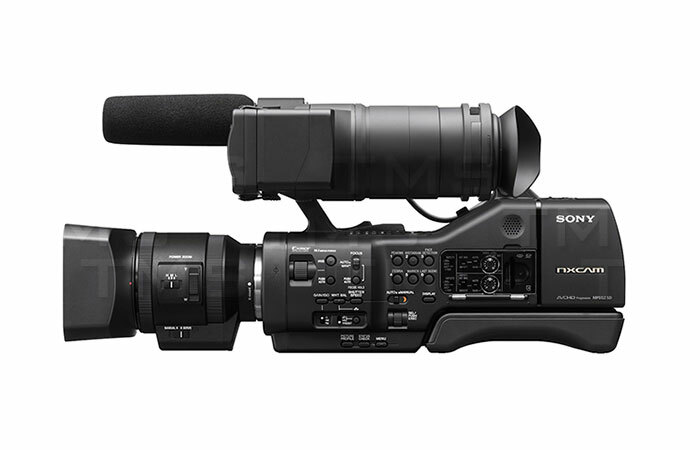 Sony’s HXR-FMU128 flash memory unit can dock directly to the camcorder for recording an immediate backup. The camcorder is compatible with the new Mirroring Memory Stick (MS-PX64/32/16) which is the world’s first memory card featuring a “Mirroring” function. This enables the card to deliver high reliability and data security through a dual recording (mirroring) function. This new professional memory card will be available in 3 different capacities: 16GB; 32GB and 64GB.